Begin by asking the person with a mobility issue where they’re experiencing the most difficulty in the home. 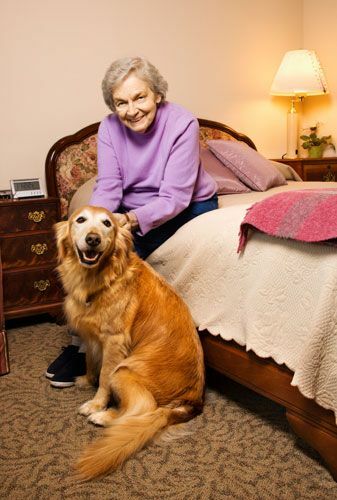 Aside from mobility and safety issues, you can also help them think about other areas where they may be experiencing some difficulty, such as how and where things should be stored, how to clean certain things around the home, and how to make food and meal preparation easier for them. After you both have written some key issues and concerns down, go into every room of the house and really study each area, going through the person’s daily routine in your mind, and think about what they do in each of these rooms and what problems they may encounter. Every little thing, from the alarm clock in the bedroom to how the food is placed inside the kitchen cupboards, needs to be taken into consideration in order to achieve a good level of comfort, ease and safety. Alarm Clock -purchase and alarm clock that has large enough controls to make it easier to use than one with small buttons and dials. See Help for Low Vision for more convenient product ideas. Bed – position the bed where it will give the person enough space to move around it easily. Try and get an electrically-controlled adjustable bed that allows the person to regulate its height, If desired, you can also add guard rails that will help support the person when they need to turn over and keep them from falling out of bed. See The Medical Benefits of Adjustable Beds. Bedside lighting – use a heavy, stable lamp or some form of wall lighting with illuminated switches. Keep chords and wires away from where people walk. See The Right Lighting Prevents Falls. Nightstand – use a non-slip or non-skid material on the bottom or base of items that are needed on the table. Rugs – to prevent falling, tripping, or slipping, avoid using area rugs. If these types of rugs are needed or desired, be sure to attach the rug to the floor so it won’t slip when under foot, and avoid using rugs which are thick. Closet – place storage items at eye level. Install concertina-style closet doors which slide and fold, making opening and closing easier. Fit door(s) with handles that are comfortable and easy to grip. Arrange clothes according to how often they are worn. Bath/Shower – use a non-slip mat on its floor. Keep bathing products close to where they are used, and make sure they are in easy-to-handle containers. Install support bars for gripping. For the tub, use a plug with a chain attached in order to safely unplug it. Fill the tub only half full, and use a thermostat-controlled tap. Consider using a bath/shower chair or a bath lift. See All About Grab Bars and Hand Rails for Safety and Detailed Guide to Shower Chairs and Bath Benches. 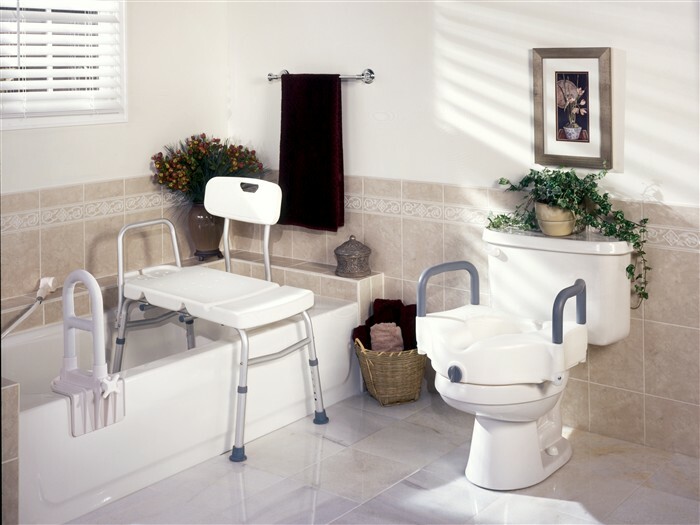 Personal care corner – if you have room to do so, create an area in the bathroom that’s specifically for your loved one where they can sit down for personal activities. If the bathroom isn’t big enough for this, try to place a comfortable chair that will fit at the bathroom counter just long enough for them to get ready with a bit more ease and remove when no longer needed. Toothbrush – get one with an enlarged handle for easy gripping, or consider purchasing an electric toothbrush. See 10 Simply Fabulous Arthritis Aids and Dental Care Tips for the Elderly. Hairbrush – use brushes and combs with long handles. Hairdryer and other electronic devices used for personal care – leave these permanently plugged in to avoid problems with taking the plugs in and out of a socket. Whenever possible, try and use cordless products. Medicine Cabinet – if there’s room, try and place it at eye level; otherwise, make arrangements to store medications and other toiletries that are needed with regularity in an easy-to-reach container. Nail care – always use nail clippers instead of nail scissors. Floor – use bathroom mats that have a non-skid backing. Sink/tub/shower – Install an individual tap for hot and cold; consider getting a thermostatic mixer tap for all water fixtures. Toilet – make sure it has a seat that raises the height of the toilet, and install support bars around the area. See How to Buy an Elevated Toilet Seat – Important Details. Toilet paper dispenser – use one that stays firmly attached to the wall and is in easy reach. Door privacy; make sure that it can be easily unlocked from outside if needed, as well as using a lock that’s easy for the person on the inside. Chairs – when preparing meals, it’s a good idea to have an office chair or studio chair to sit in while doing so. Coffee maker – choose a simple model with a handle that’s easy and comfortable to grip, and has an accurate spout. Consider getting an electric coffee maker; leave it plugged in permanently to make shutting it on and off easier. Electrical sockets – place appliances to give easy access to electrical sockets when needed. Cupboards and drawers – arrange food items on sliding trays and carousels. Place heavy items such as soup or vegetable cans at eye level. Select the most frequently used plates, cups, and cookware and place them within easy reach; avoid putting these things on high shelves. Put utensils in an easily accessible drawer. Carefully consider the needs of the person using the kitchen when selecting handles and knobs for cabinets and drawers. Food cart – utilize a food cart with wheels and at least two levels to serve meals. Food and dishes can be wheeled where needed and easily taken off and placed back on to cart. Kitchen knives – get knives that are right-angled or have a knob handle. Select chopping boards that are non-skid and easy to clean. For cutting food, get special utensils that have a cutting guide to keep the food and utensils safely in place. Kitchen sink place a shock-absorbing rubber mat on the bottom. Install a mixer-tap with thermostat control instead of individual hot and cold handles. Microwave – choose a model that has touch-sensitive controls or soft-notched buttons. Can opener – use an ergonomic electric can opener, and use specialized grips for tight jar lids. See 10 Simply Fabulous Arthritis Aids. Armchairs get chairs with firm cushions to help make it easier when getting up; there are also chair lift cushions, which can be placed in comfortable chairs, or easy-chairs that already have the lift built-in. See Detailed Guided to Finding the Right Power Lift Chair. Bookcases keep the items which are least-used on the higher shelves and light the inside of the shelves. Remote control get a universal remote that has large buttons; some of these also come illuminated. Lamps be sure to use sturdy table or floor lamps that won’t easily tip over and will give off the amount of light desired; some lamps are touch-sensitive, and are easier to use for someone who may have problems manipulating a small switch. See The Right Lighting Prevents Falls. Telephone it’s best to use a large button cordless, allowing for use anywhere in the room; keep cords, base, and telephone connection out of the way of general passage areas. See Help for Low Vision for more product suggestions. Floor/area keeping as clutter-free as possible. Use shelves to store items, and place things which are used most on the bottom for easy-access. If parking the car inside, be sure that there is plenty of clearance on all sides to ensure safety when getting in and out of it, as well as when walking around it to get to something. Work benches should be kept clean, with any sharp or flammable items stored in their proper place, inside a safe container. Door use an electric garage door opener with remote control and wall switch. Stairs have the entire stairwell brightly lit, and clearly mark where stairs begin and end, either with brightly-colored masking tape or with directional lighting that can be concentrated at the exact points where stairs begin and end. Make sure that stairwells have banisters running the full length on both sides. Use night lights in dark areas. See The Right Lighting Prevents Falls for more details on lighting. Hallways/corridors be sure that light switches are large and easy to reach and at the appropriate height. Install support bars, if needed, throughout the length of the corridor. Doors mark thresholds with a strip of brightly-colored tape or paint. Use standard lever handles. 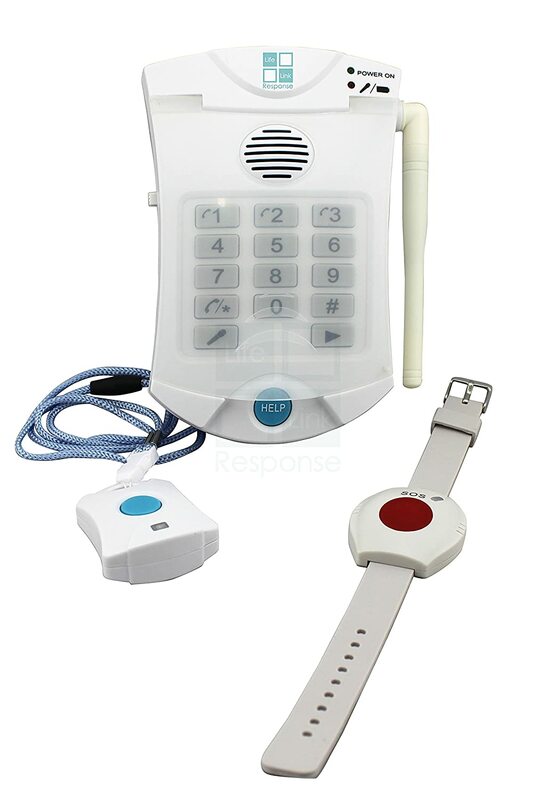 Alarms use a personal emergency response system which has a cordless alarm that can be worn around the wrist or neck. For a home alarm system, select a very simple model that connects to a telephone assistance service and uses a remote control or a swipe card to activate and deactivate. Windows install windows which slide open and shut, or use windows that pivot and have lever-type handles for easy use. Vacuum cleaner get a model that’s lightweight and easy-to-manage, and has an automatic cord-rewind. Be sure it has a three-pin electric plug with a ring handle for easy plugging and unplugging. Washing machine/dryer select top loading machines. Get models that have touch-sensitive control panels, or controls with large knobs. 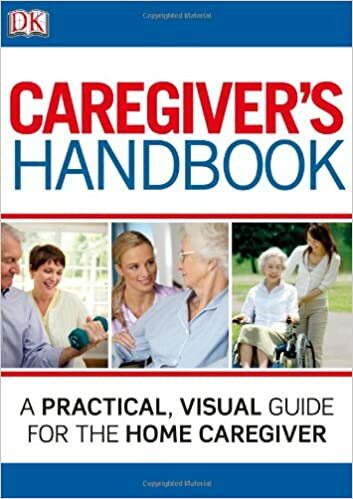 Caregiver’s Handbook is a highly-rated, comprehensive guide, covering all aspects of caregiving. I found the chapter on “Making Changes to the Home” particularly helpful. If you only read one book on caregiving, this one covers everything. Should You Install Bed Rails? Know The Risks! New Hands-Free Shoes Make Dressing Easier!